The footage above really does resemble Valve's co-op zombie shooter. I'm not complaining though; the overview shows off all the best elements I remember from Left 4 Dead, with a melee twist. It's a game about co-op survival, overcoming hoards of enemies with the occasional special i̶n̶f̶e̶c̶t̶e̶d̶ rat-men that requires working together as a team to overcome. It's even got an AI Director. The overview goes into some detail about the melee system, which bodes well. I'm not ashamed to say the line "physical hit detection enables the game to precisely determine the direction and velocity of each strike" gets me a bit excited. Left 4 Dead in a well established, much loved fantasy world with melee combat that can compete with the likes of Chivalry? Yes please. 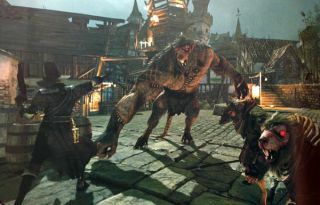 Vermintide comes out October 23.